Indus owns 90% participating interest in a Block RJ-ON/6. The on-shore Block RJ-ON/6, operated by an affiliate company, Focus Energy Limited ("Focus"), is located in Rajasthan state in western India and currently covers an area of approximately 4,026 square km. The Block is part of the Indus Basin, which straddles eastern Pakistan and western India. Several oil and gas discoveries have been made in the surrounding blocks and extensive exploration has been further committed in this region. As per Wood Mackenzie, a total of 34.8 TCF of commercial recoverable gas reserves has been discovered in the region, out of which some 14.6 TCF are yet to be produced. Gas production from these fields currently is averaging between 2100 to 2300 mmcf/d. Indus continues with an aggressive exploration & appraisal campaign to maximize its reserve base. Indus has been one of the very few companies in India, which has been able to commence gas production so early in its license holding period. Indus commenced its gas production from its first discovery (SGL), even while it has been simultaneously continuing with exploration/appraisal of other discoveries in the same block. This feat is all the more remarkable as the SGL discovery is located in the remote area with no access to cross country pipeline network or a ready infrastructure. 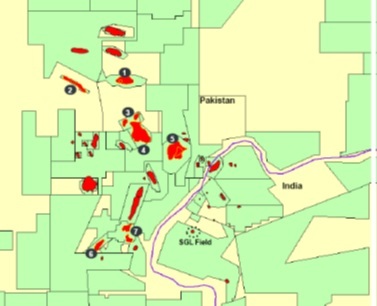 Indus was granted SGL Field Development approval on an early production basis in March 2009 for which Indus has been granted a mining lease covering an area of 176 km2. Within a short period of one year a large infrastructure development consisting of a dedicated 6" gas pipeline of ca. 90 km (owned by GAIL) connecting SGL Field with an existing power generation unit, production wells, connecting flow lines, gas gathering station and gas processing facilities were completed and commercial sale of gas commenced in July 2009 with a modest flow of 7 mmcf/d. As of September 2012, these production facilities has been substantially ramped up for an increased production capacity of up to 65 mmcf/d with Indus commissioning one of the largest CO2 Amine Stripping plant in India and associated infrastructure along with drilling and completion of over 12 production wells. For the sale of gas, Indus has signed a gas sale purchase agreement (GSPA) in August 2009 with GAIL (India) Limited, pursuant to which GAIL has committed gas off-take of around 33.5 mmcf/d (processed gas) under "Take or Pay" terms. GAIL has entered into a back to back gas sale arrangement with a 270 MW Rajasthan State owned power plant located at Ramgarh, which is currently being expanded to 430 MW. Indus is in advance stage of negotiating further gas supply agreements including with GAIL for monetization of additional reserves. Gas production additionally has been generating a modest amount of condensate, which is sold to local parties. Currently, Indus realizes ca. 8% of revenues from condensate sale/production. The Block RJ-ON/6 is operated by Focus Energy Ltd, India, which has day to day operation responsibilities. Focus has significant E&P operating experience and currently operates a total of five on-land/offshore oil and gas blocks in India. As an Operator, Focus has in-house expertise in various aspects of oil and gas exploration including drilling, seismic acquisition, mud engineering, cementing, mud logging, drill stem testing, open hole logging, logistics and real time information management. Focus has over 2000 employees in its exploration division and has dedicated access to large number of on-land rigs, 2D/3D seismic equipment, hydro-fracturing equipment and other equipment/infrastructure required for E&P in otherwise difficult operating environment in Rajasthan desert.